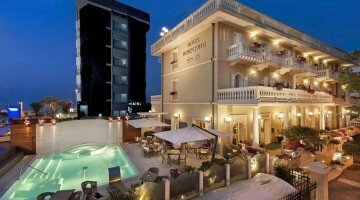 Hotel Novecento , 3-star superior hotel in Riccione, features a heated swimming pool with a waterfall and a hydromassage, a fitness center, a sauna and a massage room. For guests: three parking possibilities, free WI-FI throughout the entire hotel and elegant rooms also with sea view. Accept small animals. 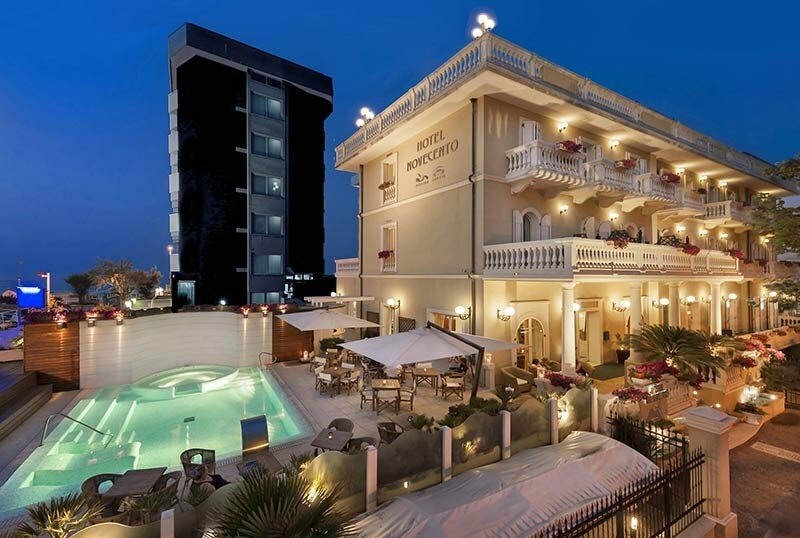 The hotel is located in Riccione very close to the sea, about 5 minutes walk from the canal port. The position allows customers to move easily on foot and by bicycle. COMFORT: intimate and welcoming, they can be single, double and triple. All with parquet floor, air conditioning, private balcony overlooking the sea or the tree-lined avenue (all have a private balcony), satellite TV, WI-FI. Some doubles can accommodate a cot or a cot. SUPERIOR: they are 27 sqm large, composed of a sleeping area with a sommier double bed and a living area with a double sofa bed. They have two balconies overlooking the sea and two LCD TV 40, a bathroom with a window and allow the addition of a cot. SUPERIOR PENTHOUSE SUITES: inaugurated in 2018 and furnished in Mediterranean style, they contain colors and natural materials, cared for in every detail and completely soundproof. They consist of two connecting rooms, the living area with a double sofa bed and the sleeping area with a sommier double bed. They are equipped with walk-in closet, high-speed WI-FI, two 40 "LCD TV, double window with balcony overlooking the sea or the tree-lined avenue.The bathroom boasts precious materials and finishes and the shower in some suites has a glass directly on the darkroom with Venetian blinds Among the services offered: individually controlled air conditioning, electronic safe, minibar, telephone, high-speed WI-FI, possibility to add cot or crib and accessories for children. Swimming pool with hydromassage, solarium terrace with sea view, garden, free use of bicycles, fitness area with Technogym carpet and personal trainer, wellness area with sauna and solar shower, lift, free shuttle to airport and station, welcome drink, theme nights. On request: beach towel and laundry service. PARKING: covered and uncovered, indoor video surveillance garage. All are available on request. CONVENTIONS: beach, amusement parks, spas, discotheques, waterslide, shuttle service and organized excursions on request. SERVICES FOR DISABLED: entrance with lift platform, lift for disabled people, bathroom with accessible shower and special chair. BREAKFAST: international buffet, set up in the living room or by the pool. Every morning a wide choice of homemade desserts, brioche, jams, fruit juices, hot bread and coffee. LUNCH AND DINNER: lunch is buffet style with flexible hours. At dinner, La Brasserie restaurant serves Romagna dishes, homemade pasta and seafood in a 3-choice menu. VARIATIONS: vegetarian dishes, gluten-free cuisine on request. OTHER: Theme dinners, candlelit dinners and after dinner with a dessert buffet are organized. Finally, by reservation you can have the Romantic dinner, a special romantic dinner to be enjoyed on the pool terrace with a choice of fillet and lobster. In the hotel: children's pool (depth 1.25 m), entertainment, baby / mini club, strollers. On request: baby sitter and pediatrician. At meals: baby food , baby menu, bottle warmer, afternoon snack, high chairs. At the beach: nursery, playground areas, mini club, live entertainment. The pool measures 50 square meters and is located in the garden, in the middle of a solarium area with natural wooden loungers. It is equipped with hydromassage stations, cervical blade, salt water and heated. The pool area hosts pleasant aperitifs, prepared in the indoor bar (always open) at sunset and themed dinners with special tastings, a dessert and fruit buffet. The hotel has an agreement with the Women's Beach n. 97 and with the Otello Bath n.99. Both offer nursery, playground, mini club.